I watched as the 40 inch HD screen became splattered in virtual blood. Roaming through room after room of an abandoned building in a deserted city, my nerves were on edge as shots fired out from unknown assailants. Suddenly I am in a room containing gigantic spiders with blue poisonous bellies jumping at me in all directions. I ask my son “How is this any fun?” My DH answered, “It’s a Guy thing!” Then in response to my puzzled expression, he said with his hands in the motion of crocheting lace, “We can’t see the fun in this.” They don’t know what they are missing. 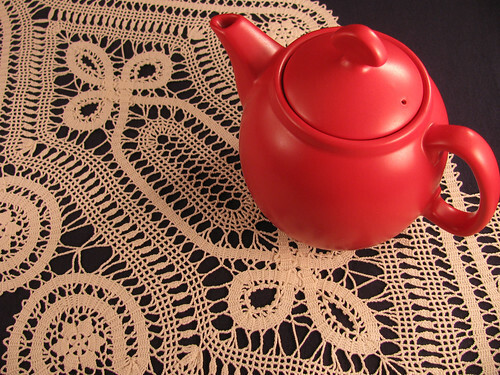 At least I have something pretty to put under the teapot when I am done. This is the first photo I published to flickr though i-photo on the mac. I didn’t get to enhance it first like I usually do on the PC. It is so much faster to use the mac. I just need to figure out how to get the photos into photoshop from i-photo. The runner isn’t this shade of virtual brown. It is a light ecru shade of off white in reality. This entry was posted on Monday, March 2nd, 2009 at 12:46 pm and is filed under Crochet. Tagged: Crochet, Lace, Thread. You can feed this entry. You can leave a response, or trackback from your own site. I don’t get the “guy thing” either! Probably never will….